Founded in the wake of the Civil War in 1867, and in the shadow of the mountain which bestows its name, The Storm King School is steeped in the history of the place, the events and the time. 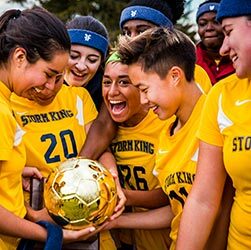 Today, thanks to an ingrained tradition of philanthropy, The Storm King School continues to be one of the Northeast's preeminent student-centered boarding and day schools in which its curriculum and community are shaped around the needs of our students and built on the School’s history of exceptional programs that honor tradition and practice innovation. Every gift to Storm King is important. Gifts made each year through the Storm King Fund provide students with critical resources and access to a transformative academic experience. Academics, athletics, performing and visual arts, scholarship aid, campus speakers, technology, and faculty professional development are just a few examples of what your gifts help provide. The generosity of the Storm King School’s alumni, families, and friends can be seen in the depth and breadth of the academic programs, the stunning mountain-top campus setting, and the co-curricular opportunities in which each student avails themselves. Philanthropic support has guided the course of the school’s history and its evolution into a small, elegantly complex school community committed to the well-being of each student and their development into responsible leaders for the 21st Century society. Thank you for investing in The Storm King School and in the lifelong success of our students.